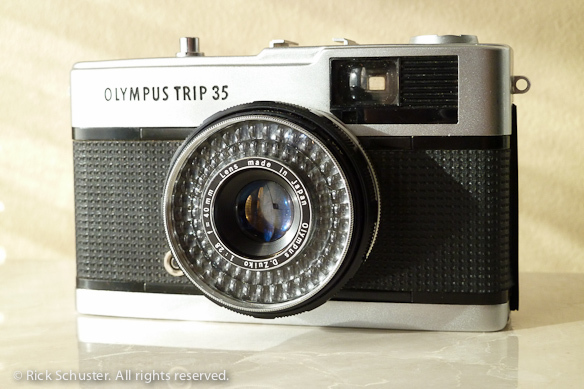 The Olympus Trip 35 has such a following by ‘trippers’ that I had to find out why people love it so. After carrying it around in a jacket pocket and snapping away with it, I’m starting to understand. It’s a small, lightweight, easy-to-use camera capable of taking great photos. The only difficulty is guessing at focus distance, since it has no rangefinder. Other than a few out-of-focus shots due to this, the results I’ve gotten have been great. The simple auto-exposure system works great. The lens is relatively sharp. Colors look great. While lightweight, it has a fairly solid feel to it — not too light, not too much plastic (actually there’s very little plastic on it, except for a few small parts like trim around the viewfinder window — it’s almost all metal and feels very solid despite it’s light weight). It’s small enough to carry around easily, and I especially like that the lens doesn’t stick out too far from the body. The f:2.8 Zuiko lens is a nice wide 40mm, which is a nice departure from most of my other 35mm viewfinder and rangefinder cameras that have 45 or 50mm lenses. It’s a great focal length for wide landscapes, street shots, etc. the view though the viewfinder looking downward to see how the lens is focused. Shooting is pretty easy. 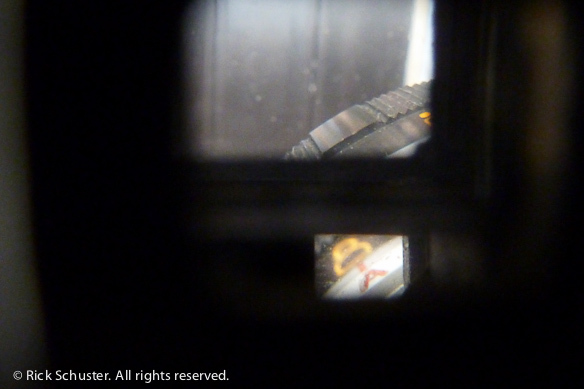 Set it in “A” for Auto (after setting your film ASA on the lens barrel), set your focal distance, and fire. 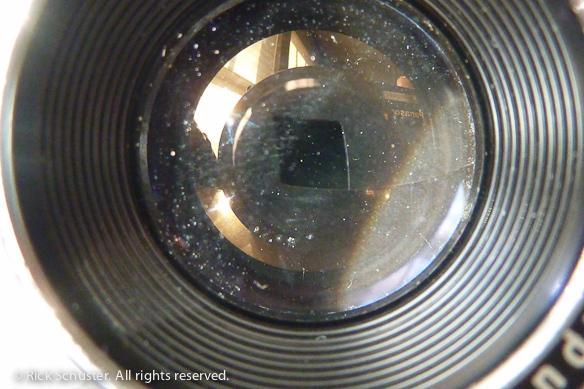 The lens includes little icons for various focal distances — a head for close-up, two people, three people for small-group distance, and a mountain for infinity. A cute little feature is how you can look down a bit as you look through the viewfinder and see a little window showing the symbol for where you’re focused. I don’t find the feature real useful, but kind of cute nonetheless. 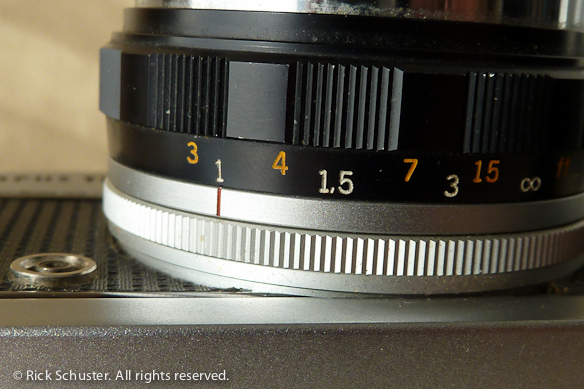 The light meter surrounds the lens and is powered by a selenium cell, for completely battery-less operation. I guess some old Trip 35s have burned out light meters, but mine works great. Keep a lens-cap on it to keep the meter working longer. Looking forward to shooting more with this. I think because of it’s compact size and ease of use, it’ll be in my jacket pocket now and then. I know mine was made before 1978 because it has a silver shutter button. After that the button was black. Exposure control won’t let you take a photo that’s too underexposed if it in the ‘A’ (automatic) setting – a red thingy will pop up in the viewfinder and the camera won’t fire. Not sure if it does the same for overexposure. 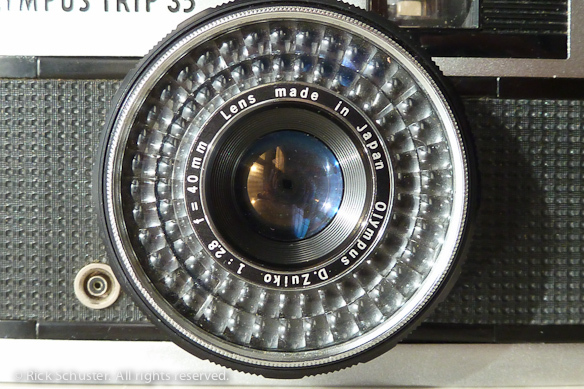 Made in Tokyo, Japan by Olympus Optical Co. Ltd.
Ken Rockwell has a page about this camera where he compares the lens sharpness to that of a high-end Canon “L” series lens, with surprising results. 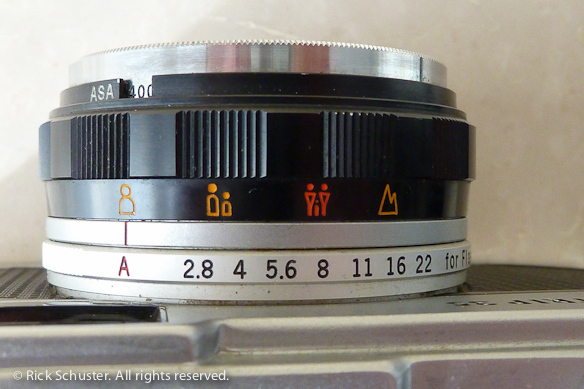 On the bottom of the lens barrel are markings in feet and meters for more accurate focusing. The simple diamond-shaped two-blade aperture opens to the appropriate size as you push the shutter button half-way down, and locks in place if you hold the shutter at half-press (this could allow you to do some exposure compensation by purposely pointing toward a lighter or darker area for the exposure, pressing half-way, then recomposing your image). If you need to make repairs (I didn’t), this page seems to have some good info. I have one in green leatherette that was serviced. Not used it yet ! As an Olympus repairer for thirty years, I can say that the Trip is a fantastically capable camera. But I’ve never seen a plastic one! -They are all metal. Not much goes wrong, and the selenium cell very seldom fails. The most common problem is that the aperture blades sometimes stick together with oil and don’t open as you press the shutter. Never seen shutter blades stuck, ever! Sometimes a loose screw from inside lodges in the magnet in the meter coil, rendering it inoperable, but if you buy one for parts and pull it apart, you’ll see how beautifully simple it is. Wonderful design. The lens is exceptionally sharp, especially in good light when it may be at f8 on automatic exposure. 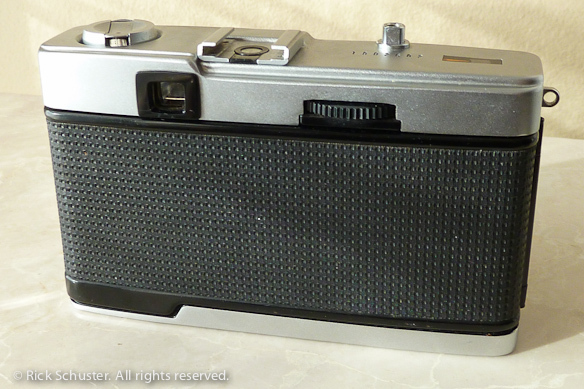 Overall, a terrific, portable film camera. Thanks for the insight, Bruce. It’s a great little camera. Oh, I understand your comment about plastic/metal now — my comment about it not having too much plastic might be misleading — it is almost all metal, with only some smaller parts made of some kind of plastic. I think I’ll update my text to clear that up. Thanks! Hello, I noticed that no dedicated Facebook Group existed for the Trip 35, so I started one. 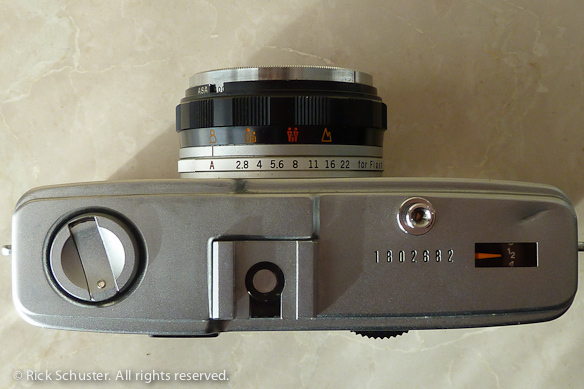 Anybody is welcome to join the group and share their love of this legendary camera with other users around the world. You can also buy and sell Trip 35 cameras, and accessories.